LIVE VIDEO: State Department Briefing On North Korea - Joe.My.God. 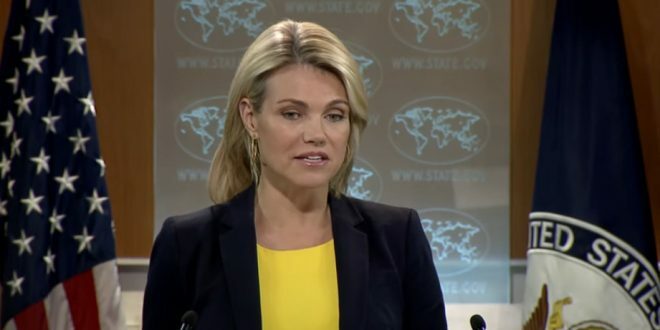 State Department spokeswoman Heather Nauert will hold a briefing Wednesday on the heels of tense exchanges between the U.S. and North Korea. A day earlier, President Trump threatened North Korea with “fire and fury” in response to reports of a new milestone in the country’s nuclear quest. South Korea’s Yonhap News Agency reported that North Korea’s military is considering a missile launch aimed near U.S. strategic military installations in Guam. Secretary of State Rex Tillerson has urged calm, saying he sees no “imminent threat” of attack.